Quick, how many of you out there have ever written a genuine, quill-and-parchment, mailed-with-a-stamp and sealed-with-a-kiss love letter? That's what I thought. Ever since the advent of the internet, honest-to-goodness love letters-which once were spun out to novelistic lengths by nineteenth-century masters of the form-have become as rare on the ground as spotted leopards (or whatever endangered species suits your fancy). Here's how to write a love letter that will make your enamored swoon with rapture and, yes, surprise. Use classy pen and paper. Somehow, a love letter written with a blue Bic on office stationery bearing the motto "You want it done WHEN?" doesn't exactly invoke violins and roses. At the very least, roust up some heavy-stock, elegant-looking paper, and if you must use an ordinary pen, choose one with a classy color of ink. Open with a tender salutation. "Dear Sirs" or "To Whom It May Concern" are businesslike and direct, but they don't quite set the proper tone of intimacy. Instead, try "my dearest _" or "my beloved_," and be sure to get the name of the person right (you'd be surprised how many first-time letter writers flub this small but important detail). Pour out your heart. 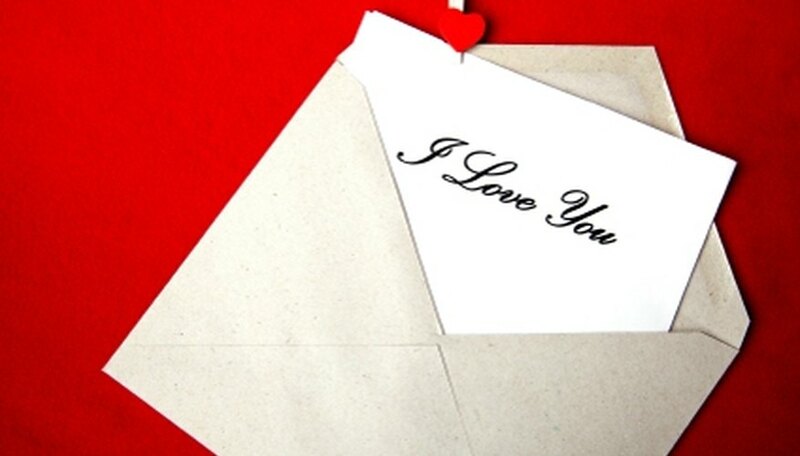 A love letter isn't like a high-school essay, with an introduction, expository text, and recapitulation. What you're aiming for here is an inexhaustible, stream-of-consciousness recitation of the virtues of your beloved, contrasted with your own inimitable shortcomings. As a general rule: the higher the virtue-to-shortcoming ratio, the classier the letter. Stay focused. If you find yourself running out of material, don't resort to the dental checkup you had the other day or that guy at work, you know, the really annoying one? Who always plays his radio so loud? And I've complained and complained to the boss but I guess no one at this company takes me seriously? Instead, take a break until your romantic fount is replenished and you can get back to that virtue/shortcoming thing. Close with a tender valediction. As in step #2, the cumulative effect of your heartfelt love letter will be completely negated by a lame "regards," "sincerely" or "respectfully yours." Consider something more pungent, such as "if only 'twere written in blood, your abased servant, on whose unworthy head I bid thee bestow thine blessing," etc. etc. Hire a calligrapher. Once you've chosen the proper envelope and stamp-again, consult rule #1-consider hiring a master of fruity scripts to inscribe your beloved's name and address. The handwriting should be fancy enough to make the mailman squint, but not so fancy that your beloved thinks she's received an invitation to a Bar Mitzvah. Strauss, Bob. "How to Write a Love Letter." Dating Tips - Match.com, https://datingtips.match.com/write-love-letter-3333.html. Accessed 20 April 2019.